Syria: Has President Assad won the war? The Syrian government and the main opposition umbrella group have accepted the terms of a US-Russia deal to cease hostilities from Saturday. 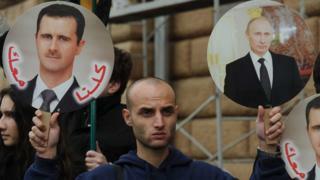 Syrian President Bashar al-Assad had questioned whether it would be practically possible to implement the ceasefire. Russian air strikes and support from Iran have helped President Assad win key battles. Internationally, the threat from so-called Islamic State and the growing role of jihadi groups within the Syrian opposition have caused those countries which had wanted him gone to consider whether that remains a viable policy. Three experts spoke to the BBC World Service Inquiry programme before the Syrian government agreed to the terms of the latest deal, about whether President Assad has effectively won the war. Jennifer Cafarella is the Syria analyst at the Institute for the Study of War, a US military think tank. "President Assad certainly has momentum on the battlefield. The armed opposition is mobilising significantly in order to prevent him, however, it does remain likely that Assad will be able to encircle Aleppo, after which we're expecting to see a siege and starve campaign. "The recapture of Aleppo City could actually be sufficient to encourage many Syrian opposition fighters to stop fighting, and to abandon the war against Assad. "His strategy to date has been to recapture key strategic terrain as well as to collapse opposition pockets that pose a threat to the core regime-held terrain. He's not trying to recapture all of the rural terrain that the opposition holds. Rather, he's trying to make sure that his gains are durable, and that they shore up his position militarily in places like Aleppo City, Homs, and Damascus. "The core deficit that the opposition has is air power. Assad's ability to use Russian air strikes, as well as to deploy barrel bombs is not something that the opposition can make up for without receiving shoulder-to-air missile systems that they could use to shoot down aircraft. "I think it's likely that without Iran's backing, Assad would have lost the war much earlier on, and so the continued deployment of Iranian ground troops is really keeping the regime alive and sustaining its battlefield momentum. "For the first time we've started to see calls for the mobilisation of foreign fighters to come and fight on the opposition's behalf inside Syria. It's a very dangerous indicator of the state of the Syrian opposition. They are that desperate. "Al-Qaeda's suicide bombers are an incredibly powerful military tool. Al-Qaeda uses them as a mechanism to penetrate a military base or a checkpoint: a suicide bomber can get up close and cause damage to the structure which the opposition would not otherwise be able to target. "That tactic has been incredibly effective on behalf of the opposition, and is one of the reasons why the opposition will continue to rely on al-Qaeda as this war continues. "Assad certainly is in a very strong position, and I think in the long-term, he's going to benefit from the radicalisation from the opposition. "If Assad can get the situation in Syria to a point where we have to choose between the defence of our own homeland and our desire for Assad to go in Syria, I think it is possible that he could actually come out on top." Rami Khouri is an analyst at the Issam Fares Institute at the American University in Beirut. "President Assad really relies on very, very few people to help him stay in power. That to me is a sign of weakness, not strength. "There was a moment when Syria had very good relations with Turkey but then the Turks turned against him completely. There was a moment when the Saudis had very close relationships with the Syrians, but those have all gone down the drain now. "It matters because what you see now is the Saudis and the Turks and others saying they're going to send their F16 jets and their special commando ground forces to northern Syria to bolster the rebels who are trying to get rid of Assad. "There are dangerous signs of a mini-world war going on in northern Syria. It's an extraordinary situation, with so many different parties - local, government, regional powers, foreign powers - actively shooting bullets and missiles and rockets at each other, and it's something that's totally unprecedented. "Each one of them thinks that this is an existential battle. If they lose, they are wiped out from the face of history. That's why they're willing to do this. "The Russian/Iranian/Hezbollah group are doing what they're doing because they see losing control of Syria for Assad would be a huge strategic blow to their interests. The Iranians and Hezbollah in particular need Syria as a link between them. The Russians see the serious situation as a means of regaining their role and international credibility in the region. "I don't think Assad has the possibility of remaining president for a long time. The best he can do is get to a position of a ceasefire, and then a transition which he might be involved with in the first year or two, but eventually retire. "If he's lucky, [he'll] get a deal like the Yemeni President, Ali Abdullah Saleh, which is to retire from the presidency through a political deal, and not to be sent to the International Criminal Court. I think that's really the best that he can hope for." Syrian-born Hassan Hassan is an analyst at the Tahrir Institute for Middle East Policy in Washington DC. "When the Russians came to Syria, that gave [the regime] some security that they could actually stay, and the country is heading towards something more positive. So that gave Assad some confidence as in they supported his project. They supported his survival. "And when Isis started to advance towards Salamiyah, people started to say 'maybe our future is tied to the regime, and we better be under the protection of the regime'. So that city was secured by the regime, and no longer has contact with the opposition. Salamiyah became a stronghold for the regime. "[The question of whether someone in his inner circle could betray him] is the question that has been circulating in Western capitals. But I think there are practical reasons why that's not possible. "A regime supporter explained this to me in a good way. If Bashar al-Assad wants to pick up his phone and call someone and say 'release that prisoner', he will find people who would listen to him and obey him. There's a line of command there that works. If someone else does that, there's a big possibility that's not going to happen. "Bashar al-Assad can get things done. And that's what drives people to stick with him - people who are part of his loyalist base or in Tehran or Moscow. They think that no-one else can replace him. Not because he's some sort of genius, but because psychologically, he represents the old order. "He has won in a sense that his strategic goal of staying in power has been achieved to a large degree, unless things change. The war is not over." The Inquiry is broadcast on the BBC World Service on Tuesdays from 12:05 GMT. Listen online or download the podcast.